On World Malaria Day, I want to share with you my personal top five methods for preventing malaria. 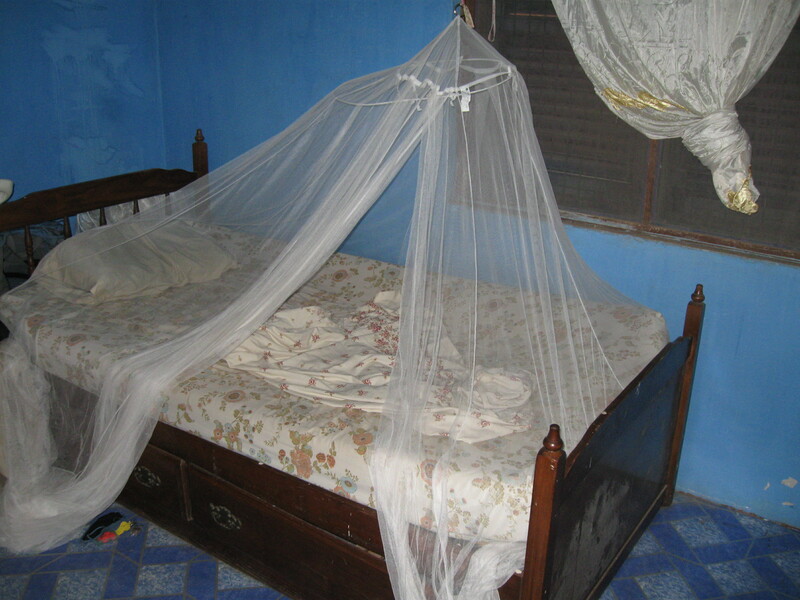 My favourite: Impregnated Mosquito Net. Not only does it keep the mosquitos out, but I like to think that it keeps the other insects and spiders out too. Plus, it makes me feel like a princess! Anti-malarials. I take a weekly malaria prevention medication called Larium. And no, I do not get crazy dreams on it. Pants. When I go out in the evenings, I wear long pants (or trousers, as we say here…pants means underpants). Malaria mosquitos come out after dark and are low flyers, so that’s why covering up from the waist down is particularly important. Malaria Socks. I’m not quite as good at this one, but I try to wear socks when I go out in the evening. Bugspray. Again, in the evenings, if I’m not wearing socks, I put bugspray on my feet and ankles. What other methods do you use? Around the world there are about 3 billion people that are exposed to malaria, that’s half the world population. Every year, aproximately 1 million people lose their lives to the disease. It is so difficult to know that malaria is PREVENTABLE and TREATABLE and also know that a child dies from malaria every 30 seconds. That’s about two children in the time that it would take you to read this post. What are the stories of those two children? Why did they get malaria? Why were they not treated? What about the stories of the millions of children who live in malaria-prone areas but have never had malaria? Or have had it, but were treated? What are their stories? According to the World Health Organization, this is becoming a more frequent story, with malaria-caused mortality decreasing by one third in Africa in the last decade. There are countless malaria success stories from around the world, driven by a huge scale-up of malaria prevention methods. As the theme of this year’s World Malaria Day suggests, how can we work to ‘sustain the gains’? What needs to be done to reach the goal of zero malaria deaths by 2015?